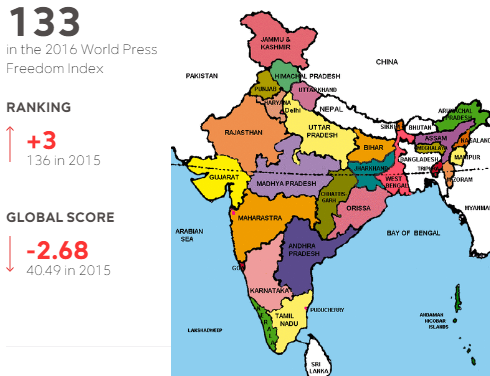 Released on Wednesday, the 2016 edition of the Paris-based not for profit Reporters Without Borders (RWB), its Global PFI ranking suggests, the only consolation for India is, four of the neighbouring countries – China, Pakistan, Bangladesh, Sri Lanka and Burma – have been given a worse ranking. Thus, China is at virtually at the rock bottom, ranking 176 out of the 180 countries, Pakistan 147, Bangladesh 144, Burma 143, and Sri Lanka 141. Interesting though it may seem, Afghanistan is found to rank better than India, at 120, and so do Nepal at 105 and Bhutan at 94. Singapore, often projected as a "heaven", ranks 154. “Wherever they work, Indian journalists are exposed to growing violence. As well as frequent verbal and physical violence, attacks by armed groups are on the rise in several states and the local authorities have had little success in reining it in”, it underlines. Among comparable BRICS (Brazil, Russia, India, China and South Africa) countries, other than India and China, Russia scores 148, down 15 points as against India, though South Africa scores a high 29, and Brazil 104. Scandinavian countries are found to be among the best performers, with Finland topping the global PFI, followed by the Netherlands, Norway and Denmark. United Kingdom ranks 38, United States 41, France 45, and Japan 72. The RWB works out its ranking based on pluralism, media independence, environment and self-censorship, legislative framework, transparency, infrastructure and abuse.